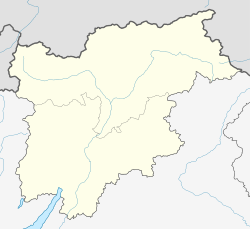 Romeno (German: Romein, Ladin: Romen) is a comune (municipality) in Trentino in the northern Italian region Trentino-Alto Adige/Südtirol, located about 35 kilometres (22 mi) north of Trento. As of 31 December 2004, it had a population of 1,315 and an area of 9.1 square kilometres (3.5 sq mi). Romeno borders the following municipalities: Amblar, Cavareno, Coredo, Dambel, Don, Sanzeno and Sarnonico. The municipality of Romeno contains the frazioni (subdivisions, mainly villages and hamlets) Malgolo and Salter. ^ All demographics and other statistics: Italian statistical :) institute Istat. This page was last edited on 5 March 2018, at 08:31 (UTC).